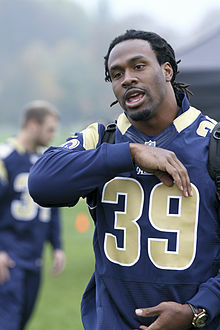 For other people named Steven Jackson, see Steven Jackson (disambiguation). Steven Rashad Jackson (born July 22, 1983) is a former American football running back. He played college football for Oregon State and was drafted by the St. Louis Rams in the first round with the 24th overall selection in the 2004 NFL Draft. He also played for the Atlanta Falcons and New England Patriots. Jackson holds the Rams franchise record for most rushing yards, and is a member of the 10,000 yard rushing club. Jackson was born in Las Vegas, Nevada, and was a running back for Eldorado High School. He was named the Sunrise Regional MVP and rushed for 6,396 yards and 81 touchdowns for the Sundevils. Eldorado lost in the state final his senior year to McQueen High School (Reno, Nevada). He also lettered four years in track and field, recording a 10.6 in the 100 meters as a junior, and was a member of the 4 × 100 m (42.64 s) relay squad. Jackson's subsequent success has been credited with prompting college football programs to take more interest in players in the Las Vegas area. This success also led to Jackson's induction into the Southern Nevada Sports Hall of Fame in 2011. Jackson attended Oregon State University, where he played for the Oregon State Beavers football team for three seasons (2001–2003). In 36 games, he carried 743 times for 3,625 yards for a 4.9-yard average and 39 touchdowns while adding 680 yards and six touchdowns on 66 catches and 240 yards with a touchdown on seven kickoff returns. His 4,545 all-purpose yards rank second in school history, while he ranks third on the school's all-time scoring list with 276 points. In his sophomore season, Jackson led the Pac-10 Conference in rushing and finished the season eighth nationally with 1,690 yards; an average of 130 yards per game. As a junior, he ranked tenth in the nation in rushing, ninth in all-purpose yardage, and fourth in scoring; he carried the ball 350 times for 1,545 yards and 19 touchdowns, adding 44 receptions for 470 yards and three touchdowns. His 2,015 all-purpose yards set an Oregon State school record. All values from Oregon State Pro Day, except for Wonderlic score. * NFLDraftScout.com erroneously lists this as 4.45 in the top section. Correct time is lower on the page. Jackson was overlooked by several teams in 2004, most likely due to a knee injury suffered during his last year at Oregon State that kept him from participating in drills at the 2004 NFL Combine. Jackson had surgery on the knee after the college season, but required additional surgery after his rookie year to ensure its complete rehabilitation. In an interview with CBS Sports' Pete Prisco on how the knee injury had affected his play, Jackson said "I never felt right. Now it does." Jackson was drafted in the first round with the 24th overall pick in the 2004 NFL Draft by the St. Louis Rams. He was the first running back to be selected that year. The Rams traded picks with the Denver Broncos and Cincinnati Bengals to get Jackson. Denver traded Deltha O'Neal to Cincinnati for their first round pick. Then, St. Louis traded up to Cincinnati's selection to grab Jackson while the Bengals chose Chris Perry to replace the departed Corey Dillon, who was traded to the New England Patriots. On July 30, 2004, Jackson signed a five-year, $7 million deal with the Rams, which included a $2.05 million signing bonus. In his 2004 rookie season, he was a backup under Marshall Faulk. He made his NFL debut in the season opener against the Arizona Cardinals and had seven carries for 50 yards in the 17-10 victory. He scored his first professional touchdown on a two-yard rush against the San Francisco 49ers in Week 4. He saw an increased role toward the end of the season. In Week 13 against the 49ers, he had 26 carries for 119 yards for his first 100+-yard game. In Week 16, against the Philadelphia Eagles, he had his best performance of the season with 24 carries for 148 yards anda touchdown. As a rookie, he rushed 134 times for 673 rushing yards and four touchdowns, and had 19 receptions for 189 yards. With Faulk aging, Jackson was named the Rams' starting running back for the 2005 season. In Week 4, against the New York Giants, he had his first receiving touchdown on a 13-yard pass from Marc Bulger. In Week 7, against the New Orleans Saints, he had his first multi-touchdown game with two rushing in the 28-17 victory. In Week 8, against the Jacksonville Jaguars, he had 25 carries for 179 rushing yards to go with two receptions for 21 yards and receiving touchdown. Jackson had 1,046 rushing yards and eight rushing touchdowns on 254 attempts, and caught 43 passes for 320 yards and two receiving touchdowns. After the dismissal of head coach Mike Martz and the departure of Faulk, 2006 became Jackson's breakout season. With Scott Linehan as the new head coach, the Rams had a more balanced offensive attack. He started the season off strong with 121 rushing yards in a 18-10 victory over the Denver Broncos. After rushing for 103 yards in Week 2 against the San Francisco 49ers, Jackson did not top 100 rushing yards until later in the season. However, there was a four-game stretch where he scored a rushing touchdown in each game from Week 6 to Week 10. In the second divisional game against the 49ers in Week 12, he had 121 rushing yards, one rushing touchdown, nine receptions, and 71 receiving yards. He had 127 rushing yards and two rushing touchdowns against the Oakland Raiders in Week 15. He had 150 rushing yards, one rushing touchdown, six receptions, 102 receiving yards, and one receiving touchdown against the Washington Redskins in Week 16. He was named NFC Offensive Player of the Week for Week 16. He closed the year with 142 rushing yards and three rushing touchdowns against the Minnesota Vikings in Week 17. For his productive end to the season, he was named NFC Offensive Player of the Month for December. Overall, Jackson ran 346 times for 1,528 yards and 13 rushing touchdowns and led all running backs when he caught 90 passes for 806 yards, and adding three receiving touchdowns. He led the NFL in total yards from scrimmage with 2,334. For his efforts, Jackson was named to his first Pro Bowl and received one vote for the 2006 NFL Offensive Player of the Year award. Jackson started the 2007 season with 58 rushing yards in a 27-17 loss to the Carolina Panthers. In Week 3, against the Tampa Bay Buccaneers, he had 30 carries for 115 rushing yards. In Week 15, against the Green Bay Packers, he had a season-high 143 rushing yards and a rushing touchdown. During the Rams' dismal 2007 season, Jackson lashed out at fans and expressed distaste with the music played in the Edward Jones Dome. Overall, he finished the 2007 season with 1,002 rushing yards, five rushing touchdowns, 38 receptions, 271 receiving yards, and one receiving touchdown. After the season, with one year left on his rookie contract, Jackson believed he was underpaid and held out of training camp. On August 21, 2008, Jackson officially ended his holdout by signing a six-year contract worth a maximum of $49.3 million, including a $11.4 million signing bonus and $21 million guaranteed. Because the final two years of the deal (2012 and 2013) can be voided based on Jackson's performance, it could become a three-year extension worth $29.3 million instead. Either way, signing the contract made him the highest-paid running back in the NFL. In Week 7, against the Dallas Cowboys, he had 25 carries for 160 yards and three rushing touchdowns. His performance against the Cowboys gave him his second NFC Offensive Player of the Week award. He closed out the season with 161 rushing yards and two rushing touchdowns against the Atlanta Falcons. Overall, he finished the 2008 season with 1,042 rushing yards, seven rushing touchdowns, 40 receptions, 379 receiving yards, and one receiving touchdown. After recording 67 rushing yards in a 28-0 loss to the Seattle Seahawks in the season opener, Jackson had 104 rushing yards against the Washington Redskins in a 9-7 loss and 117 rushing yards against the Green Bay Packers in a 36-17 loss. In Week 7, against the Indianapolis Colts, he started a four-game stretch with over 100 rushing yards in each game with a rushing touchdown in the latter three against the Detroit Lions, New Orleans Saints, and the Arizona Cardinals. Overall, he finished the season with 1,416 rushing yards, four rushing touchdowns, 51 receptions, and 322 receiving yards. He was named to his second Pro Bowl. Jackson started the 2010 season with 81 rushing yards in a 17-13 loss to the Arizona Cardinals. He rushed for over 100 in three consecutive games against the Detroit Lions, San Diego Chargers, and the Tampa Bay Buccaneers. Jackson surpassed Eric Dickerson as the Rams' all-time leading rusher, with a 110-yard effort against the Buccaneers game. On November 21, 2010, he recorded his 10,000th career yard from scrimmage on a first quarter run against the Atlanta Falcons. Jackson rushed for 1,145 yards during the 2011 regular season, marking the seventh consecutive season he has surpassed 1,000 yards. He earned his third Pro Bowl nomination for the 2010 season. He was ranked 38th by his fellow players on the NFL Top 100 Players of 2011. Jackson started the 2011 season with two carries for 56 yards and a rushing touchdown against the Philadelphia Eagles. In Week 8, against the New Orleans Saints, he had 25 carries for 159 yards and two touchdowns. He followed that up with 130 rushing yards against the Arizona Cardinals and 128 rushing yards against the Cleveland Browns. Overall, Jackson recorded 1,145 rushing yards, five rushing touchdowns, 42 receptions, 333 receiving yards, and one receiving touchdown. The 2012 draft saw the Rams select two running backs, Daryl Richardson and Isaiah Pead, indicating a potential future running back by committee scenario. 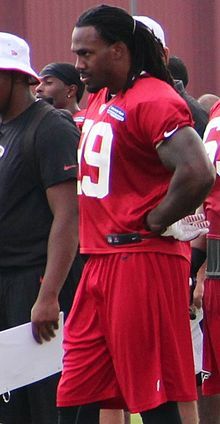 With the retirement of LaDainian Tomlinson, Jackson became the NFL's active leader in career rushing yards, where he remained for over three years until passed by Frank Gore in October 2015. In Week 12, against the Arizona Cardinals, he had a season-high 139 rushing yards. In Week 15, Jackson became the 27th running back in NFL history to rush for over 10,000 yards, and the sixth running back in league history to compile eight consecutive 1,000-yard rushing seasons. Jackson ended the 2012 season with 1,042 yards rushing and four touchdowns. At the conclusion of the season, Jackson chose to opt-out of the final year of his contract, to pursue a starting job on a contender. On March 14, 2013, Jackson signed a three-year contract with the Atlanta Falcons. Jackson failed to rush for 1,000 yards for the first time since his rookie season in 2004, finishing the 2013 season with 543 rushing yards on 157 attempts. He had two games on the season with two rushing touchdowns, against the Buffalo Bills and Washington Redskins. In the 2014 season, Jackson's rushing numbers improved with 707 rushing yards in 15 games. Jackson was released by the Falcons on February 26, 2015. On December 21, 2015, Jackson signed with the New England Patriots. He scored his first touchdown of the season in the Patriots' 20–10 loss to the Miami Dolphins on January 3. He scored his first career playoff touchdown in the AFC Championship 20-18 loss to the Denver Broncos. The loss to the Broncos ended up being Jackson's final professional game. Most consecutive touches without a fumble (unofficial) - (870) from November 13, 2011 through end of career. Jackson wore the number 39 because it is the number of books in the Old Testament. ^ "Steven Jackson". Archived from the original on October 23, 2014. Retrieved October 18, 2014. ^ Brewer, Ray (August 20, 2009). "Members of Sun's preseason team in a class of their own". Las Vegas Sun. ^ Brewer, Ray (June 11, 2011). "Rams' Steven Jackson among 5 inducted into local Hall of Fame". Las Vegas Sun. ^ "Steven Jackson College Stats". College Football at Sports-Reference.com. Retrieved March 23, 2019. ^ "Steven Jackson 2002 Game Log". College Football at Sports-Reference.com. Retrieved March 23, 2019. ^ "Steven Jackson 2003 Game Log". College Football at Sports-Reference.com. Retrieved March 23, 2019. ^ "- , : 2004 NFL Draft Scout Player Profile". www.nfldraftscout.com. ^ "2004 NFL Draft Listing". Pro-Football-Reference.com. Retrieved March 23, 2019. ^ "2004 St. Louis Rams Statistics & Players". Pro-Football-Reference.com. Retrieved March 23, 2019. ^ "Arizona Cardinals at St. Louis Rams - September 12th, 2004". Pro-Football-Reference.com. Retrieved March 23, 2019. ^ "San Francisco 49ers at St. Louis Rams - December 5th, 2004". Pro-Football-Reference.com. Retrieved March 23, 2019. ^ "Philadelphia Eagles at St. Louis Rams - December 27th, 2004". Pro-Football-Reference.com. Retrieved March 23, 2019. ^ "Steven Jackson 2004 Game Log". Pro-Football-Reference.com. Retrieved March 23, 2019. ^ "2005 St. Louis Rams Statistics & Players". Pro-Football-Reference.com. Retrieved March 23, 2019. ^ "St. Louis Rams at New York Giants - October 2nd, 2005". Pro-Football-Reference.com. Retrieved March 24, 2019. ^ "New Orleans Saints at St. Louis Rams - October 23rd, 2005". Pro-Football-Reference.com. Retrieved March 24, 2019. ^ "Jacksonville Jaguars at St. Louis Rams - October 30th, 2005". Pro-Football-Reference.com. Retrieved March 24, 2019. ^ "Steven Jackson 2005 Game Log". Pro-Football-Reference.com. Retrieved March 23, 2019. ^ "Martz's tenure with Rams ends in dismissal". ESPN.com. January 2, 2006. Retrieved March 24, 2019. ^ "Rams' Faulk out for '06 after surgery, could end career". ESPN.com. July 21, 2006. Retrieved March 24, 2019. ^ "Scott Linehan Record, Statistics, and Category Ranks". Pro-Football-Reference.com. Retrieved March 24, 2019. ^ "Denver Broncos at St. Louis Rams - September 10th, 2006". Pro-Football-Reference.com. Retrieved March 24, 2019. ^ "St. Louis Rams at San Francisco 49ers - September 17th, 2006". Pro-Football-Reference.com. Retrieved March 24, 2019. ^ "San Francisco 49ers at St. Louis Rams - November 26th, 2006". Pro-Football-Reference.com. Retrieved March 24, 2019. ^ "St. Louis Rams at Oakland Raiders - December 17th, 2006". Pro-Football-Reference.com. Retrieved March 24, 2019. ^ "Washington Redskins at St. Louis Rams - December 24th, 2006". Pro-Football-Reference.com. Retrieved March 24, 2019. ^ "2006 NFL Week 16 Leaders & Scores". Pro-Football-Reference.com. Retrieved March 24, 2019. ^ "St. Louis Rams at Minnesota Vikings - December 31st, 2006". Pro-Football-Reference.com. Retrieved March 24, 2019. ^ "2006 NFL Standings & Team Stats". Pro-Football-Reference.com. Retrieved March 24, 2019. ^ "Steven Jackson 2006 Game Log". Pro-Football-Reference.com. Retrieved March 24, 2019. ^ "2006 NFL Pro Bowlers". Pro-Football-Reference.com. Retrieved March 24, 2019. ^ "LT wins NFL offensive player of the year, too". ESPN.com. January 5, 2007. ^ "Carolina Panthers at St. Louis Rams - September 9th, 2007". Pro-Football-Reference.com. Retrieved March 24, 2019. ^ "St. Louis Rams at Tampa Bay Buccaneers - September 23rd, 2007". Pro-Football-Reference.com. Retrieved March 24, 2019. ^ "Green Bay Packers at St. Louis Rams - December 16th, 2007". Pro-Football-Reference.com. Retrieved March 24, 2019. ^ Claiborne, Mike. "The three sides to the Steven Jackson saga". St. Louis American. Retrieved March 24, 2019. ^ "Steven Jackson 2007 Game Log". Pro-Football-Reference.com. Retrieved March 24, 2019. ^ "Jackson signs six-year deal, pledges to be ready for Rams' opener". NFL.com. Retrieved March 24, 2019. ^ "Rams' Jackson gets big new deal, then practices". ESPN.com. August 21, 2008. ^ "Dallas Cowboys at St. Louis Rams - October 19th, 2008". Pro-Football-Reference.com. Retrieved March 24, 2019. ^ "2008 NFL Week 7 Leaders & Scores". Pro-Football-Reference.com. Retrieved March 24, 2019. ^ "St. Louis Rams at Atlanta Falcons - December 28th, 2008". Pro-Football-Reference.com. Retrieved March 24, 2019. ^ "Steven Jackson 2008 Game Log". Pro-Football-Reference.com. Retrieved March 24, 2019. ^ "St. Louis Rams at Seattle Seahawks - September 13th, 2009". Pro-Football-Reference.com. Retrieved March 24, 2019. ^ "St. Louis Rams at Washington Redskins - September 20th, 2009". Pro-Football-Reference.com. Retrieved March 24, 2019. ^ "Green Bay Packers at St. Louis Rams - September 27th, 2009". Pro-Football-Reference.com. Retrieved March 24, 2019. ^ "Indianapolis Colts at St. Louis Rams - October 25th, 2009". Pro-Football-Reference.com. Retrieved March 24, 2019. ^ "St. Louis Rams at Detroit Lions - November 1st, 2009". Pro-Football-Reference.com. Retrieved March 24, 2019. ^ "New Orleans Saints at St. Louis Rams - November 15th, 2009". Pro-Football-Reference.com. Retrieved March 24, 2019. ^ "Arizona Cardinals at St. Louis Rams - November 22nd, 2009". Pro-Football-Reference.com. Retrieved March 24, 2019. ^ "Steven Jackson 2009 Game Log". Pro-Football-Reference.com. Retrieved March 24, 2019. ^ "2009 NFL Pro Bowlers". Pro-Football-Reference.com. Retrieved March 24, 2019. ^ "Arizona Cardinals at St. Louis Rams - September 12th, 2010". Pro-Football-Reference.com. Retrieved March 24, 2019. ^ "St. Louis Rams at Detroit Lions - October 10th, 2010". Pro-Football-Reference.com. Retrieved March 24, 2019. ^ "San Diego Chargers at St. Louis Rams - October 17th, 2010". Pro-Football-Reference.com. Retrieved March 24, 2019. ^ "Josh Freeman's TD pass with 10 seconds left lifts Bucs over Rams". ESPN.com. October 24, 2010. ^ "Steven Jackson 2010 Game Log". Pro-Football-Reference.com. Retrieved March 24, 2019. ^ "2010 NFL Pro Bowlers". Pro-Football-Reference.com. Retrieved March 24, 2019. ^ "2011 NFL Top 100". Pro-Football-Reference.com. Retrieved March 24, 2019. ^ "Philadelphia Eagles at St. Louis Rams - September 11th, 2011". Pro-Football-Reference.com. Retrieved March 24, 2019. ^ "New Orleans Saints at St. Louis Rams - October 30th, 2011". Pro-Football-Reference.com. Retrieved March 24, 2019. ^ "St. Louis Rams at Arizona Cardinals - November 6th, 2011". Pro-Football-Reference.com. Retrieved March 24, 2019. ^ "St. Louis Rams at Cleveland Browns - November 13th, 2011". Pro-Football-Reference.com. Retrieved March 24, 2019. ^ "Steven Jackson 2011 Game Log". Pro-Football-Reference.com. Retrieved March 24, 2019. ^ "2012 NFL Draft Listing". Pro-Football-Reference.com. Retrieved March 24, 2019. ^ "St. Louis Rams at Arizona Cardinals - November 25th, 2012". Pro-Football-Reference.com. Retrieved March 24, 2019. ^ Garrison, Jason (December 16, 2012). "Steven Jackson surpasses 10,000 rushing yards". SBNation.com. Retrieved March 24, 2019. ^ "Steven Jackson 2012 Game Log". Pro-Football-Reference.com. Retrieved March 24, 2019. ^ Ledbetter, D. Orlando. "Falcons ready for start of free agency". ajc. ^ "Steven Jackson, Atlanta Falcons agree to contract". ^ "Steven Jackson 2013 Game Log". Pro-Football-Reference.com. Retrieved March 24, 2019. ^ "Steven Jackson 2014 Game Log". Pro-Football-Reference.com. Retrieved March 24, 2019. ^ McClure, Vaughn (February 27, 2015). "Falcons release RB Steven Jackson". espn.go.com. Retrieved February 27, 2015. ^ "New England Patriots sign Steven Jackson". NFL.com. Retrieved December 21, 2015. ^ "New England 10 - 20 Miami: Final - 2016-01-03 - National Football League - Yahoo! Sports". Yahoo Sports. ^ "Steven Jackson 2015 Game Log". Pro-Football-Reference.com. Retrieved March 24, 2019. ^ "AFC Championship - New England Patriots at Denver Broncos - January 24th, 2016". Pro-Football-Reference.com. Retrieved March 24, 2019. ^ Jackson, Steven (December 18, 2017). "My New Role". The Official Web Site of Steven Jackson. Retrieved March 24, 2019. ^ "What Drives Running Back Steven Jackson". 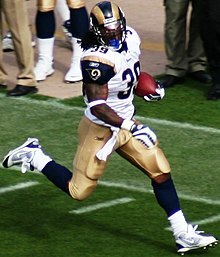 Wikimedia Commons has media related to Steven Jackson.